← Thoughts on publishing. And Words? 105,297 of them. Chapter finished at 107,549 Words. Huzzah! Hello all! 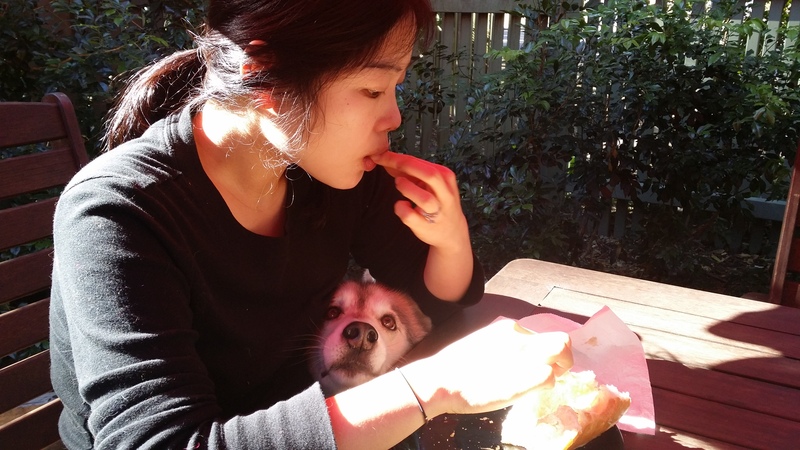 Here’s a picture of my dog begging my wife for food at lunch time, just because the depth of doggie expression in his eyes is awesome. Y’know what else is flipping awesome? Reaching goals that you’ve set for yourself. Sure, I said I’d get the second of the missing chapters done in a couple of days, and it took about a week, but it’s an eleven-thousand word chapter, and the original plan was for only five thousand. Ten minutes had passed, and preparations for the next race were made. I saw that Kioni was back on the paddock, ready to ride her Number Four again. Now that the jig was up, she had her hair tied back against her neck like a bundle of snakes. I found the bookie sitting where I’d left him, amidst a pile of new tape and tickets, worrying his hat around in his hands. His loop of coins was skinnier than the last time I’d seen it. The other gamblers expressed outrage at this. His eyes widened, and he mouthed back what I’d said. The start of the cup race was only seconds away. He wobbled like a struck ninepin, ignoring the other attempted last-minute bets. The gun fired, and the horses launched out of the gate. Ed came rocketing onto the track below from the service entrance, eight shining silver legs driving divots into the vertical turf wall, like a rocket-powered jackhammer. “That one,” I said, and jumped over the railing. That’s all for now. Hope you enjoyed! This entry was posted in Writing and tagged fiction, Planning, story excerpt, Writing. Bookmark the permalink. 2 Responses to Chapter finished at 107,549 Words. Huzzah! Excellent. Definitely want to keep reading this one and learn all about that silver horse. Ahh… Yeah, you got me! Hahaha. It’s fun to look back over my posts to where I started in June at about the 61K mark, almost like doing two half Nanowrimos back-to-back. Thanks mate, really glad you liked it. (Mr) Ed, AKA Sliepnir’s Figurehead / Ship’s Computer, is one of the supporting cast of characters in the story, and makes his first (fairly explosive) appearance in chapter one.